The chainsaw went silent as the chain broke cutting down the sixth of eleven leylandii but there was no peace as the sound of a 44 ton articulated lorry attempting to get round the tight bend in the lane assailed our ears. 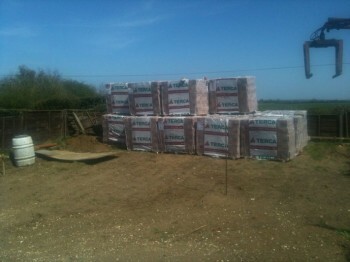 The delivery driver bringing our 10,000 bricks was about to give up but with a little encouragement the lorry was coaxed into position alongside the plot. 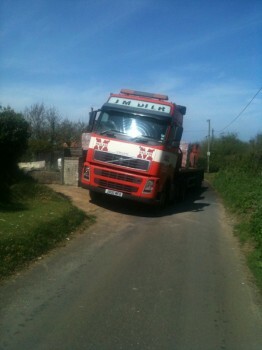 Once the bricks were unloaded, we followed the lorry down the lane to make sure it got away safely and then took a trip to Heacham to get the chainsaw mended. 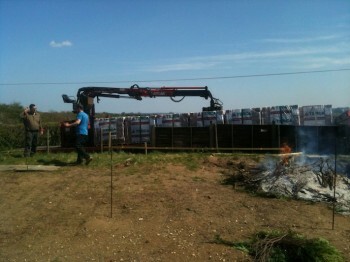 By 4pm the remainder of the leylandii had been felled and burnt, and the neighbourhood was left to the peace of the Bank Holiday weekend, birdsong replacing the racket we had produced.